Down below the surface of a quiet pond lived a little colony of water bugs. They were a happy colony, living far away from the sun. For many months they were very busy, scurrying over the soft mud on the bottom of the pond. They did notice that every once in a while one of their colony seemed to lose interest in going about with its friends. Clinging to the stem of a pond lily, it gradually moved out of sight and was seen no more. Up, up it went slowly. Even as they watched, the water bug disappeared from sight. Its friends waited but it didn’t return. “That’s funny!” said one water bug to another. “Wasn’t she happy here?” asked a second water bug. “We promise,” they said solemnly. When he awoke, he looked about with surprise. He couldn’t believe what he saw. A startling change had come to his old body. His movement revealed four silver wings and a long tail. Even as he struggled, he felt an impulse to move his wings. The warmth of the sun soon dried the moisture from the new body. He moved his wings again and suddenly found himself up above the water. He had become a dragonfly. Swooping and dipping in great curves, he flew through the air. He felt exhilarated in the new atmosphere. By and by, the new dragonfly lighted happily on a lily pad to rest. Then it was, that he chanced to look below to the bottom of the pond. Why, he was right above his old friends, the water bugs! There they were, scurrying about, just as he had been doing some time before. 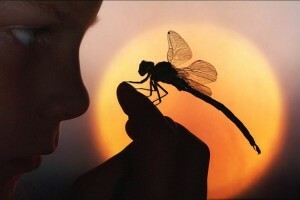 Then the dragonfly remembered the promise. “The next one of us who climbs up the lily stalk will come back and tell where he or she went and why”. The dragonfly then winged off happily into its wonderful new world of sun and air. Thank you God, for the story of the water bugs and the dragonflies. Thank you for the miracle that makes beauty out of change and dragonflies out of water bugs. Please remember my child, who has left the pond we live in. Give my child a good life too, in a wonderful new world of love beyond our vision. I also ask that you please remember me, and let me some day be with my child again.